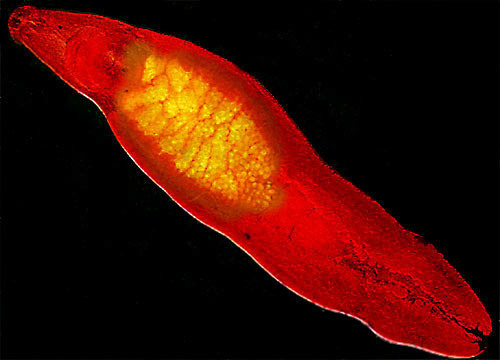 Like many other parasites, these trematodes have a three host life cycle involving two intermediate hosts and one definitive host. Fluke eggs are introduced into water by means of feces from an infected host. The eggs are consumed by snails, which serve as the first intermediate host. Inside the snails, the eggs can complete their gestation and proceed to hatch. Newly hatched worms, termed cercariae, leave the snail host to live inside fish, the second intermediate host. Burrowing their way through the flesh of a fish, cercariae encyst themselves inside the fish's muscle tissue. The cercariae lose their tails, undergo some additional growth changes, and are subsequently termed metacercariae. The metacercariae reside inside their fish hosts, awaiting introduction to a definitive host. A human (or another fish-eating animal) becomes the final host by eating the raw flesh of an infected fish, and a single infected fish may contain over a thousand of the encysted worms.